A VPN service is only as good as its servers and when it comes to the number – the more, the merrier. PureVPN does very well in this department, boasting over 750 servers worldwide. However, it is important to know how to pick the right server. In this text, we will go over ways to choose the fastest PureVPN server, the qualities that make PureVPN servers different from the competition, and we will also take a look at its server locations. If you are a fan of DIY solutions, you can also try out the manual configuration option. PureVPN suggests you try out these DNS servers: fastest-usserver.ptoserver.com; fastest-auserver.ptoserver.com; fastest-ukserver.ptoserver.com; fastest-purevpnserver.ptoserver.com; and purep2p.ptoserver.com. Although it can be useful, this option requires more work and we believe that most users would find the speed test tool option more appealing and convenient. Regardless of the PureVPN package you choose, you can access all of its 750+ servers. This is great news if you do not wish to invest into long-term subscriptions. You don’t have to pay more to get more. PureVPN also brings you unlimited server switching. Once again, this is true for all packages. There is no speed throttling either, so you can enjoy both unlimited bandwidth and unlimited speed. It is interesting to note that PureVPN operates servers in Africa. This is something we do not see often in VPN services and it is one of the great advantages of this VPN provider. By subscribing to PureVPN services, you get access to over 80 000 IP addresses. What is even better, you can choose between shared and dedicated IP addresses, which is a possibility you do not always get with your VPN. No third parties have access to the data you transfer when using PureVPN servers. This is possible due to the fact that PureVPN has a self-managed network, which means that they are the only ones who get to handle the traffic. We have saved the best for last. What we love most about PureVPN is its Purpose Selection feature. The software allows you to specify the desired purpose, be it watching sports, Netflix streaming or any other of a number of purposes listed. Once you make your choice, the software instantly chooses the best server, keeping in mind the purpose and location. PureVPN has really gone big when it comes to the number of servers and server locations. 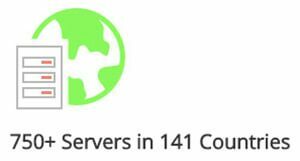 It operates servers in 141 world countries, 180 locations total. As we have previously mentioned, it boasts over 750 servers, which is quite impressive. The servers are distributed all over the globe. They are located in North America, Central America, South America, Europe, Oceania, Asia, and even Africa, the most underrepresented continent in the world of VPN. The largest number of PureVPN servers is in Europe, 349 to be exact, in countries such as the UK, the Netherlands, and France. The first runner up is North America, with 210 servers, followed by Asia with 120, Africa with 36, Oceania with 34, and South America with 26 servers. The smallest number of servers is in Central America, with 8 servers in Belize and Costa Rica. The number and distribution of PureVPN servers guarantee that wherever you are, whatever content you want to access, you can find the right server to suit your needs. Keep in mind the tips for choosing the fastest server and enjoy all the perks of using PureVPN. Want to find out even more about Pure VPN? Make sure to check out our Pure VPN Review for detailed information about this VPN provider.